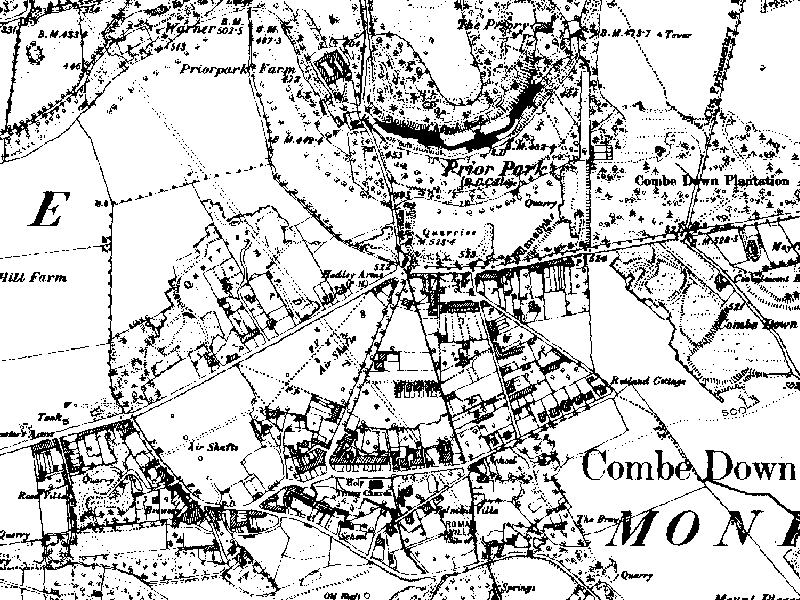 In 1700 the Down above Combe, (Monkton Combe), was common land, grazed by sheep, with the occasional barn and in a few places along the southern edge of the east-west ridge, the scars of small open stone quarries. The Romans may have quarried stone here to build the baths and temple complex in the Avon valley – they certainly left the remains of a villa on the southern slopes. Though there are signs of some quarrying in earlier times, it was the entrepreneur, Ralph Allen, who systematically developed the extraction of the fine oolitic freestone called Bath stone. He bought up land on Combe Down in the 1720’s and at his death in 1764 he had quarried above ground and underground beneath today’s village covering an area of some 17 hectares. He built a terrace of eleven cottages, De Montalt Place, designed by John Wood the Elder in 1729, to house the quarrymen. The centre one with pediment and sun dial, was the home of Richard Jones, Allen’s clerk of works. The stone cut from the mines was hoisted to the surface by cranes and loaded on to trolleys which ran on rails downhill to the stone yard at Dolemeads, Widcombe, from where the stone was ferried across the Avon to build the elegant terraces, squares and crescents of Georgian Bath, now a World Heritage Site. Just north of the village Allen built his show-case mansion, Prior Park, to display the superior qualities of Bath stone and to make a superb 18th century landscape garden in the combe with a view of the city of Bath. Allen’s heir, Earl De Montalt, sold off the railway and cranes, and instead of continuing the stone business, developed Combe Down as a health resort where visitors could escape from the smoke and coal dust in the city. He refurbished Allen’s cottages suitable for convalescents and built the elegant terrace of Isabella Place in the 1770’s. A second phase of stone quarrying began after De Montalt’s death in 1805, to the west of Allen’s mines, by independent quarry-masters led by another brilliant entrepreneur, Phillip Nowell. He was aided by the opening of the Kennet and Avon Canal in 1810 which enabled him to ship stone to Longleat, Windsor Castle and London where it was used in many important buildings such as the west garden front of Buckingham Palace, Apsley House and All Souls, Langham Place. This part of the mining history is described in the Society’s publication on the Byfield Mine. The best stone had been used by the 1840s; luckily, a new supply was discovered when Brunel drove his Great Western Railway though the hill at Box, leading to extensive quarrying in Box and Corsham. In the mid 19th century many fine villas were built in Combe Down for retired clergymen, military and people with private means. The quarrymen’s cottages now housed servants, coachmen, cabinetmakers and teachers, and the clean air and spring waters of Combe Down made it the centre for Bath’s laundering and market gardening. De Montalt’s Mill to the south produced high class paper for the refined tastes of the Bath bourgeoisie. The village is now absorbed into the city and has some 133 listed buildings; it is in the conservation area and the World Heritage Site. It has sites of scientific interest (bats, undeveloped limestone upland and geology) and is in the Cotswold Country Park area. To the north is the lovely Georgian city of Bath and to the south beautiful Somerset countryside. At present, the village is suffering from the engineering works to stabilise the old stone mines which are deteriorating; eventually making the village safe for the future. The Heritage Society sees its role as recording and nurturing the whole of the village’s past.